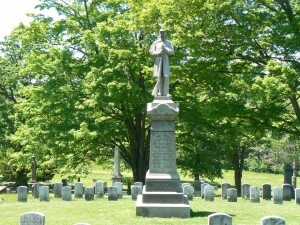 U.S. Civil War Major General Joseph K. F. Mansfield and other local Civil War veterans are honored with monuments in Middletown’s Indian Hill Cemetery. Gen. Mansfield was born in New Haven in 1803, and was a career Army officer who served in the Corps of Engineers after graduating from West Point. 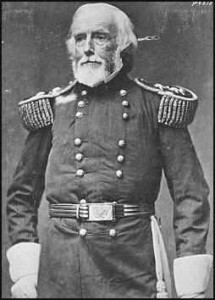 During his military service, Mansfield lived in Middletown, and his Main Street home has been restored by the Middlesex County Historical Society. 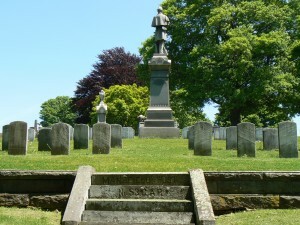 Mansfield was mortally wounded on Sept. 17, 1862, during the Battle of Antietam, and returned to Middletown for burial. 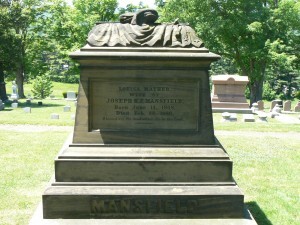 An ornate sandstone monument honoring Mansfield and his family is located in a central area of Indian Hill Cemetery, which rises above Middletown’s Washington Street (CT Route 66). 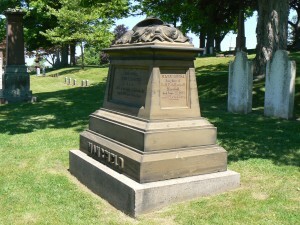 An inscription on the front (west) face of the Mansfield monument bears the general’s name, date and place of death, and his age. The inscription on the east face honors his wife, Louisa, who died in 1880. Inscriptions on the north and south faces list the couple’s two children. 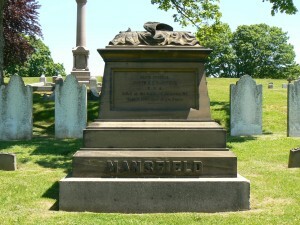 There is an interesting contrast between the Mansfield name at the bottom of the east and west faces. On the west face, it stands out from the bottom of the monument, while on the east face, it is recessed. 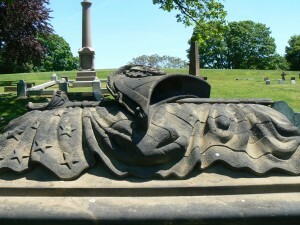 The sarcophagus-shaped monument is topped by an elaborate carving of a U.S. flag, a sword and a hat. 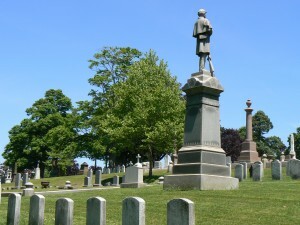 Not far from the Mansfield monument is an 1884 monument erected by the local Grand Army of the Republic (the veteran’s fraternal group formed after the Civil War) post that stands in a section of the cemetery reserved for local Civil War veterans. 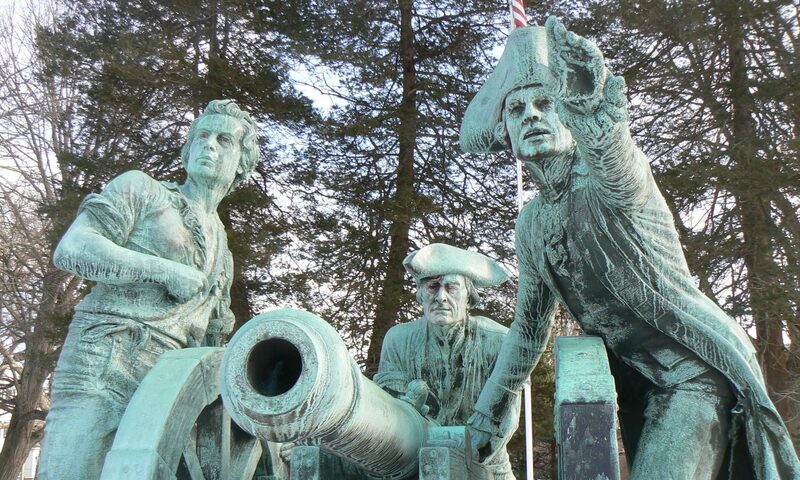 The other three faces of the monument are generally plain, other than Army Corps emblems just beneath the base supporting the figure. 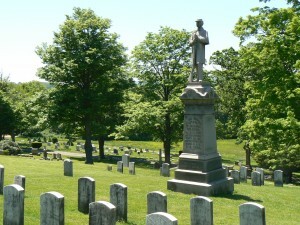 The area around the monument has a number of graves of Civil War veterans. In this post’s bottom image, Gen. Mansfield’s monument can be seen in the left third of the picture, across the road from the GAR monument (in the gap between the large trees).